Long time no see. I couldn’t function in the heat, and I couldn’t blog about laying on the couch watching movies with all the fans on me. Although I could draw it as a comic, I suppose. So today was the fortnightly transfer of the shopping centres inventory into my own home day. I mainly wanted to get a tags die, which I did. It’s a good one, coming in all the good sizes, as well as having a hole reinforcement die, which may come in handy for other projects and embellishments. While I was in the die section, I saw the hexagon die. I am in love with hexagons at the moment, and I’d seen this die online and wanted it. It’s a lot smaller than it looks in the pictures online, but it’s a bigz die, meaning that it will cut everything from paper to thick card to fabric. I can imaging hand sewing a tiny dolls quilt with the hexagons. I’d have to glue the edges to stop fraying, as they’d be too small to have a large seam. In the cheap shop, I found some stamps. I bought a mummy, a sugar skull girl and a cameo with a frame. I’m not sure how well they’ll work, being so cheap, but they were too cute to miss. 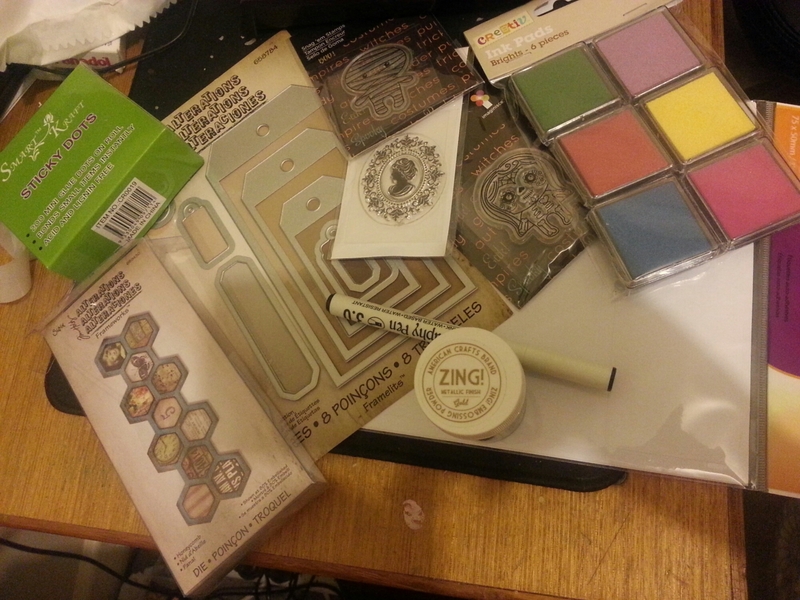 I also picked up some cheap ink. In my experience this was a bad idea, bit the price of the craft inks is so huge, that it doesn’t seem worth getting them. I don’t often use coloured inks, so I just wanted to try these out. I found using kids markers/washable water based markers on the stamps works ok if I need a colour of ink that I don’t have. 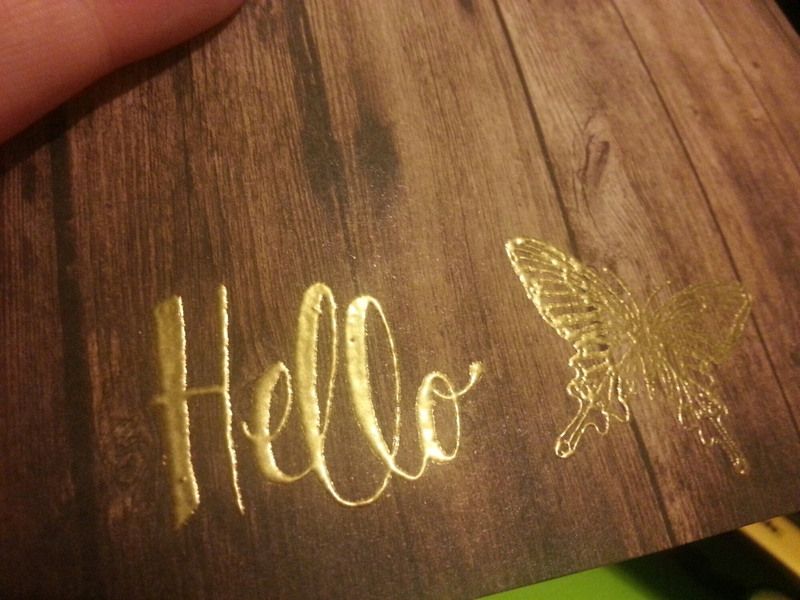 I got a new container of gold embossing powder. I found I had fun with it the other week, but all I had, was a small vial from a pack I’d gotten a while ago, and decided to get some new. They had the most beautiful blues and reds, but I didn’t think I’ll use them as much. Perhaps I’ll get the red for Christmas and go crazy with it. I’ve found embossing powder to have an expiry date, so I’ll have to write when I bought it on there. It might be the hot weather we live in. Maybe it’ll work when I get a heat gun. I got a felt tip black calligraphy pen in 3.0mm. Usually people use the felt tips for practice and dip pens or nib pens for writing the final piece, but I’m more used to just using the felt tip. I’d love to get some pilot parallel pens, someday. I found a packet of self adhesive labels that I can use to draw or print on. It’ll come in handy if I want to make stickers for cards and things to sell with the raspberry sheep logo on it. 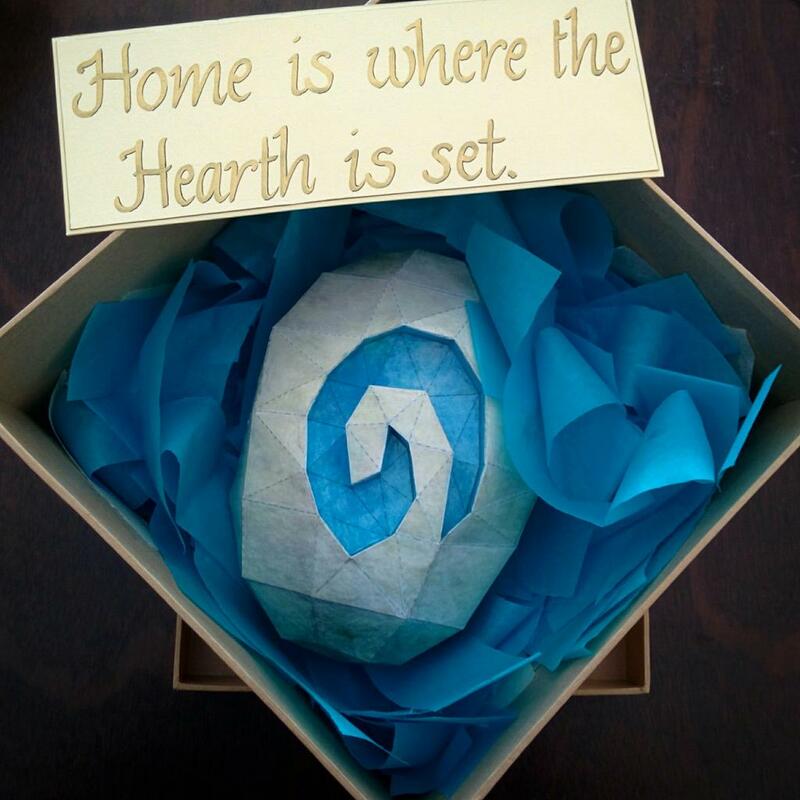 This is what I made my World of Warcraft loving partner. He took this photo, that’s why it actually looks nice. The hearthstone is an item in the game that returns you to a set point known as your hearth, which is like your home, as it’s somewhere safe. I found a pepakura file, printed it out, put it together then covered it with a sealer for a bit of strength and protection. The sealant also made the colours brighter which was a nice surprise, although the blue did run a tiny bit. I tried to hide the score lines with a bit of white paint pen, dabbing it off a bit so there weren’t stark white lines which would be as noticeable as the black ones. As for the calligraphy, I bought some nibs at the newsagent and tried them out with ink. I was so out of practice, as I’ve been using felt tip pens for so long, that there wasn’t enough time to get used to it again, and I ended up using a gold felt tip. I took a class on calligraphy for a couple of years about nine years ago now, but I’ve always liked calligraphy. I’ve been pretty bad at keeping up my practice, despite it being a great technique for cards. 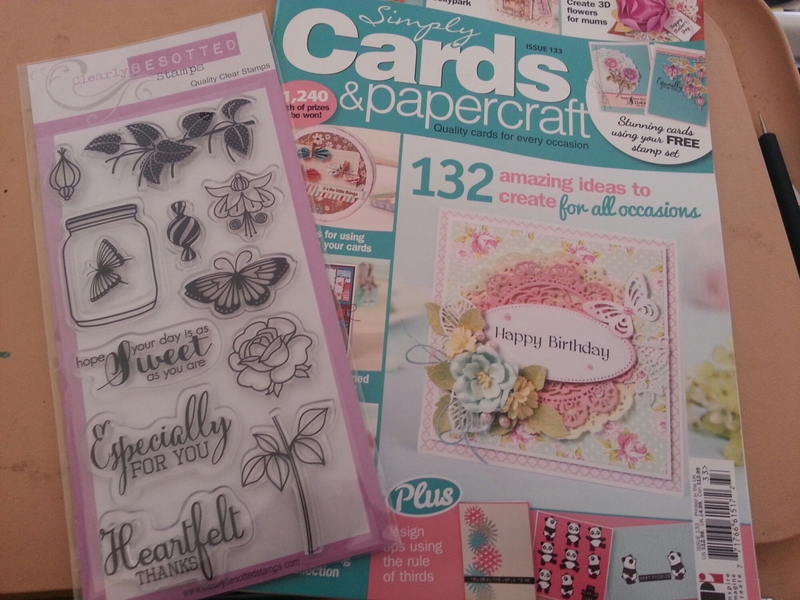 It was that course that got me really into card making, not just basic ones for my parents. The one script I can always go to without much practice is italic (not the font style.) This is because for some great reason, for my big final project, I thought I’d copy out a short version of Alice in Wonderland on a dress, which I was to sew myself. It was painstaking and I was running very late due to having issues with my essays and it was a big rush of sewing, finding tailors chalk at the local shop and the weird smell of watered down fabric paint mixed with fear of washing out the chalk. I wish they’d had fading markers around then. All this and I still only just passed (Calligraphy is based as a craft subject, so they mark you on the skill, not the effort of the piece). So although italic has some stressful memories, it is a handy, all-round script to use. Now I need to practice my favourite, Old English. 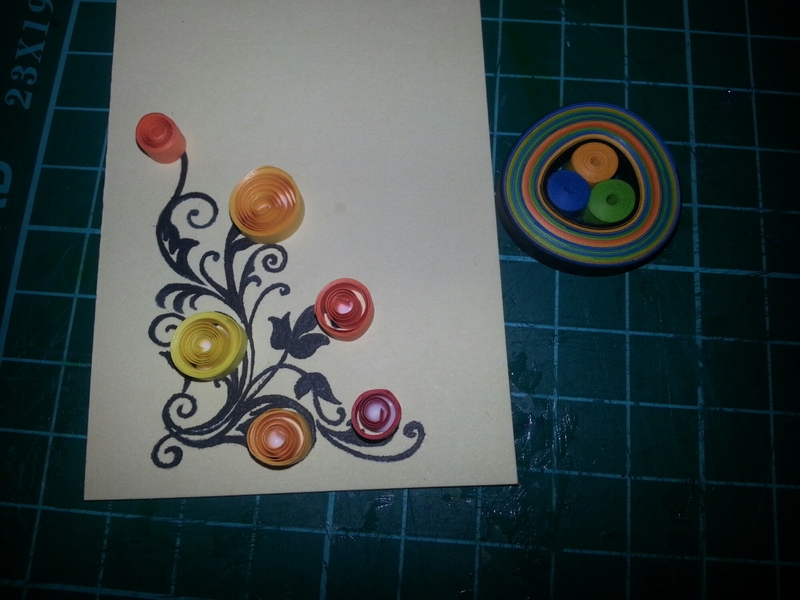 A couple of quilling ideas. The first looked way better on the pinterest version. Perhaps a larger stamp with looser flourishes. 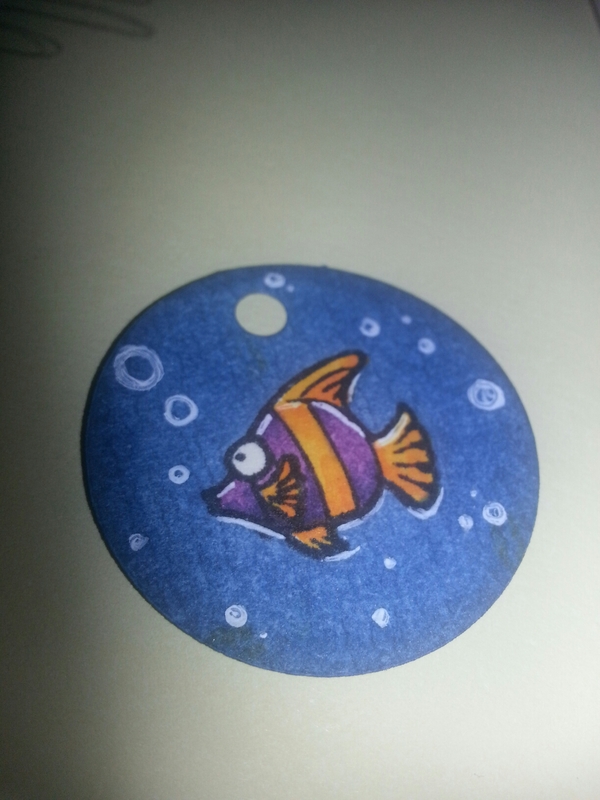 My version looks like I just put quilling randomly on a page that happened to have been stamped. It’s meant to look like flowers. 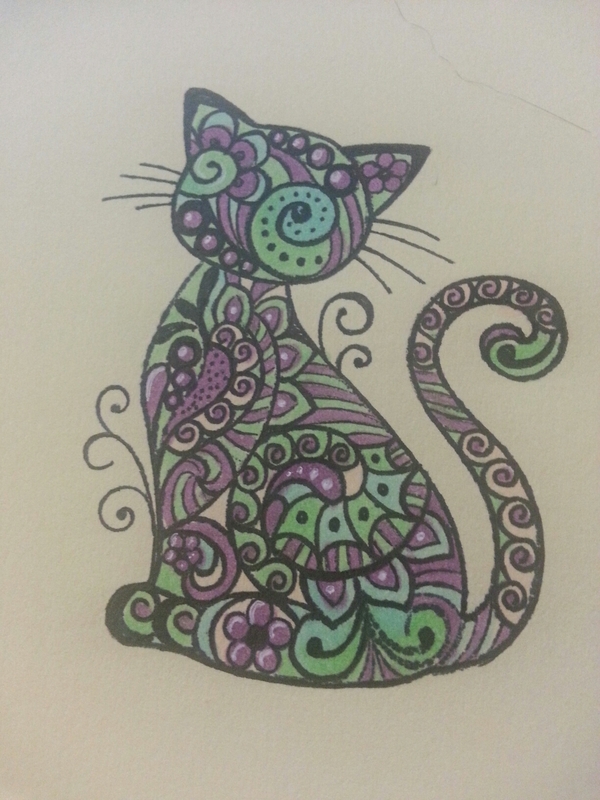 I might try with smaller paper, a bigger stamp or draw a design where it is meant to incorporate the quilled flowers. Many possibilities as always. The other idea I don’t remember seeing anywhere, but it came into my head as an idea. It’s a variant coin. 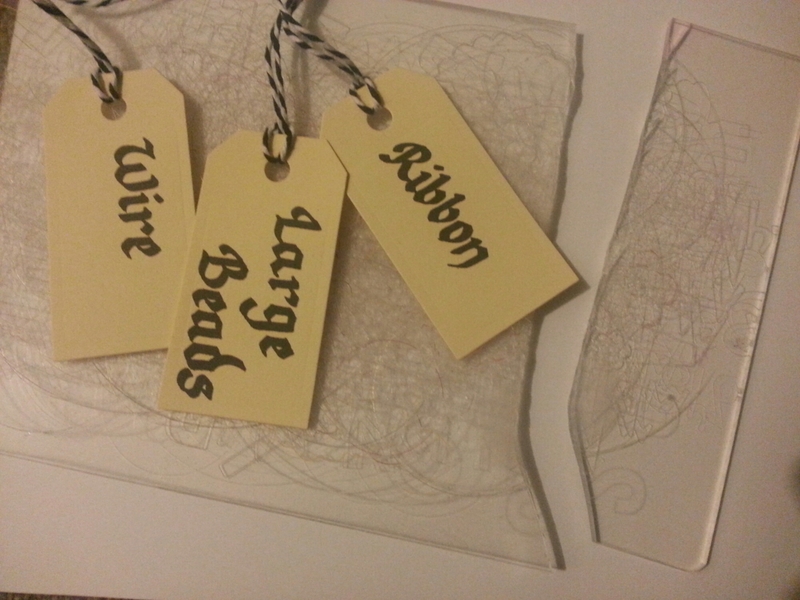 Three quilled pegs, glued, then wrapped tightly in paper. I wasn’t sure if it would be triangular or a circle but I pulled it all pretty tight, and it’s a nice shape, not quite either. I guess I could try this with two or four pegs in the middle. 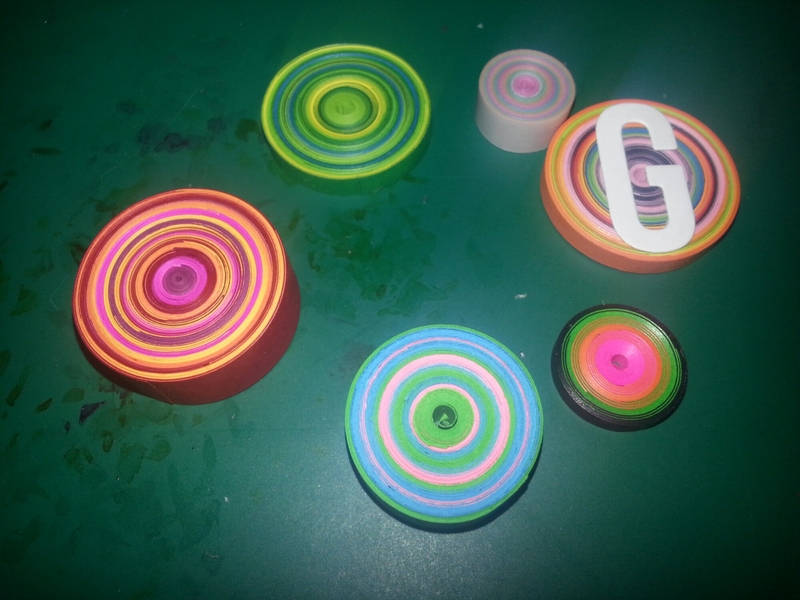 These would make a nice pendant for a necklace especially if domed with resin.